(MP185). Alma Claude Burlton Cull (1880-1931). Watercolour signed and dated 1919 (LL)..
18 x 11.75 inches (45.7 x 29.8 cms) approx. Cull had obviously had a few days at sea with the Iron Dukes as this watercolour is very similar to MP 135 (HMS EMPEROR OF INDIA, HMS MARLBOROUGH and HMS BENBOW): same ships although a different aspect and the weather has gone downhill a bit! With a date of 1919 given by the artist it possibly confirms that MP135 was indeed painted then too and it may well be that Cull was invited aboard one of the ships shortly before the squadron deployed to the Mediterranean in the late spring of that year. As with the other watercolour of these same ships at this time, the flagship, HMS IRON DUKE (Captain W W Fisher CB MVO),was not with the rest of her squadron and so here we see just the three remaining ships of the team, HMS EMPEROR OF INDIA (Captain J C W Henley) (she is identified verso in pencil  Cull’s ? handwriting), HMS MARLBOROUGH (Captain C D Johnson MVO DSO) and HMS BENBOW (Captain C D Carpendale CB). Unusually for him, Cull has used Rough Surface Winsor & Newton sketching board:  he normally used Whatman’s watercolour board which had little by way of tooth  and perhaps this too tells a story. Was this painting perhaps intended as a sketch for what subsequently turned out to be his “finished” version, the one that we see in MP 135  but with the image of the ships reversed and a more dramatic sky? Whatever. 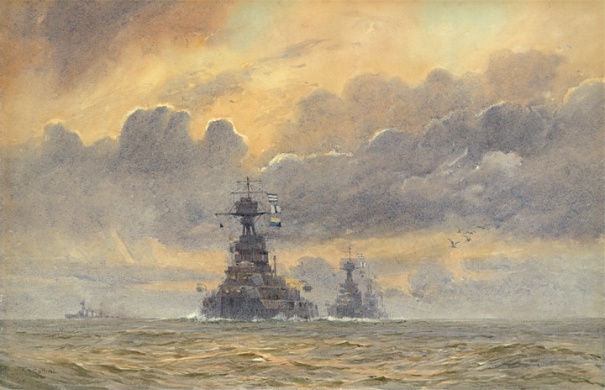 Fortunately for us Cull was clearly besotted with the capital ships of the day and he painted them all beautifully: wonderfully accurate draughtsmanship of their towering and graceful structures and always set in the most competently portrayed seas and skies. These it seems he determined to show in some of their most complicated and testing patterns and forms - and always he succeeded superbly, this watercolour being no exception. Early morning or early evening, the angry cumulus clouds spreading across the sky do not bode well for settled weather and even the seagulls over on the right seem to be scarpering off to more tranquil places! Please see MP135 (in the Maritime Prints Section) for further details on the magnificent dreadnoughts of this battle squadron.